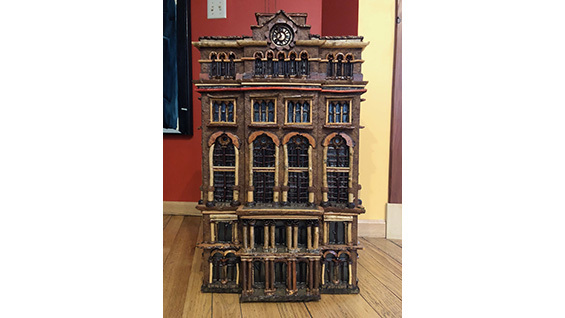 The Foundation Building's clock in miniature. Every year Berman and her husband make a point of taking their two daughters to the New York Botanical Garden (NYBG), where the couple married in 2010. While touring the train show two years ago, Ms. Berman and her then 5-year-old daughter, Allison, got into a conversation about the many museums they had visited. “The building where you work is kind of a museum,” Allison noted of the Foundation Building. The family realized that The Cooper Union’s iconic building was nowhere to be found in the display, a fact they thought should be rectified. Ms. Berman contacted the garden using a general information request form. She was surprised when Paul Busse, creator of the NYBG train show, replied. Brusse, a landscape architect and the founder of Applied Imagination, the Kentucky-based firm that creates all of the show’s models, proposed the holiday show as a way to merge his love of trains and architecture, and it has been a staple at NYBG since 1992. When Ms. Berman proposed the Cooper Union Foundation Building as a possible additional model, he took her up on the suggestion. “Paul immediately recognized the name both because of The Cooper Union's association with the arts, but also because Peter Cooper, the creator of ‘Tom Thumb’ the first [American] steam locomotive, made his first fortune making iron rails and selling them to the B&O Railroad. So we had to create this building,” Cindy Johnson, a botanical architect and model-builder with Applied Imagination, says. 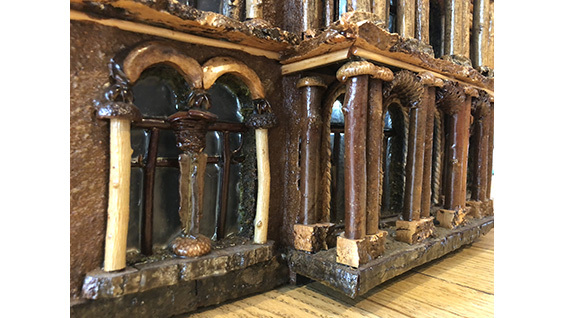 They built their model of the Foundation Building using hickory nut hulls, honeysuckle vine, black bamboo, willow branches, bark from ash and oak trees, whole pine cones and scales from pine cones. But something was missing. Busse wrote to Berman: “The only thing that I don't have and would need in order to build our botanical interpretation of the Cooper Union building is finding a source for some interesting acorn caps from the New York area. They would be vital to correctly detailing alongside the big arched windows alongside in the middle of the building. 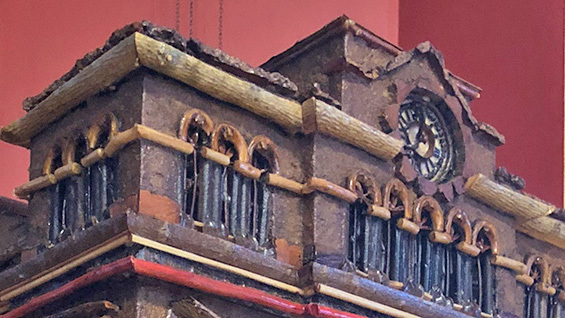 Those special acorn caps would be just the ticket to making this important New York landmark a wonderful addition to the train show.” So little Allison Berman stepped in again and supplied the necessary detail elements. Nonetheless, after its construction, there was no guarantee the NYBG show would include the Foundation Building. In fact, the model sat in the firm’s studios for more than a year and Applied Imagination even considered sending it to Washington, D.C. to be part of a display in the United States Botanic Gardens. But in the end, it has come to the Bronx, adding the pride of Cooper Square to its train show for the first time this year. This past November, Ms. Berman received the news via an email from Leslie Salka, the firm’s director, who asked if she and Allison would like a tour. “We ended up getting a tour from Paul Busse's daughter, Laura Dolan,” she said. The exhibition will be on display until January 21. Photos courtesy of Applied Imagination.